Generally when it is determined that a woman has an ovarian cyst, one of the first courses of action the doctor will take is to perform an ultrasound. An ultrasound will allow the doctor to determine the size, shape, location, and consistency of the ovarian cyst. This information helps the doctor to know the best course of treatment. In addition to the ultrasound, the doctor will often order a series of blood tests such as a pregnancy test and hormone levels. A blood test called CA-125 may also be performed, which can indicate whether or not the cyst is cancerous, although there are other conditions that may cause a rise in the CA-125 level. Due to ovarian cancer being rare in those women less than 35 years old, generally this test is only drawn on women over the age of 35. After it has been determined that the cyst is not cancerous there is a series of steps that the doctor will most likely recommend. The first step in ovarian cyst treatment is watchful waiting. Watchful waiting is a common first step for those women who are still in their child bearing years and have minimal symptoms. The doctor will usually ask the woman to return in 1-3 months for a reevaluation of the cyst. At that time the doctor will be looking for changes in size. Birth control pills are generally the next step in ovarian cyst treatment if the cyst has not decreased in size after three months of waiting. 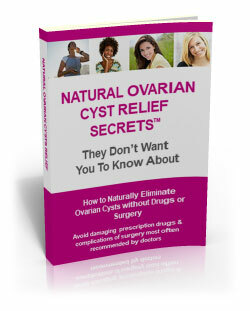 They may also be recommended for those women who have frequent cysts. The reason for this treatment is that the birth control pill will prevent the woman from ovulating. However, birth control pills carry with them a variety of side effects that can be just as detrimental as the ovarian cysts themselves…if not more so. In addition, the pills do not treat the underlying cause of the ovarian cysts which may cause more problems down the road. The final ovarian cyst treatment that doctors generally suggest is surgery. Surgery is recommended for those who have ovarian cysts that has gotten larger, is causing extreme pain, has not gone away after several menstrual cycles, or if it looks unusual. Surgery is usually performed through one of two common surgeries which are both performed under general anesthesia which carries its own set of risks. The first surgical ovarian cyst treatment is laparoscopy and involves making a small incision just above the naval. A small instrument called a scope is inserted into the abdomen and the cyst is removed. This procedure requires that the cyst be small and is usually only performed if the doctor does not believe the cyst to be cancerous. The second surgical ovarian cyst treatment is a laparotomy. This procedure involves making larger incisions in the abdomen as the cysts are usually larger. In addition the surgeon will send a tissue sample to test for cancer while the patient is still on the table. If the test comes back positive for cancer the surgeon will remove any tissue that appears to be affected. This may include but is not limited to one or both ovaries, lymph nodes, and the uterus. While these are not the only courses of ovarian cyst treatments, they are the most traditional. In future articles we will address alternative ovarian cyst treatments.